Jones Family Care, APRN, LLC is a full service NURSE PRACTITIONER OWNED family practice and minor emergency care center dedicated to the health and well being of residents of Jones, Harrah, Luther, Spencer, Choctaw, Arcadia, Wellston, and other communities in our area. We are from this area and are dedicated to serving Eastern Oklahoma County with the finest research based healthcare services. Scientific studies have shown that physical activity can reduce pain and improve function, mood, and quality of life for adults with arthritis. Physical activity can also help manage other chronic conditions that are common among adults with arthritis, such as diabetes, heart disease, and obesity. How much physical activity do adults with arthritis need? an equivalent combination* of moderate and vigorous activity. Muscle strengthening exercises on 2 or more days per week. Balance exercises on 3 days per week if at risk of falling. * A general rule is that 1 minute of vigorous intensity activity = 2 minutes of moderate intensity activity. Aerobic activity is any activity that makes your heart beat faster and breathe a little harder than when you are sitting, standing, or lying. Muscle strengthening activities should work all the major muscle groups (e.g., legs, hips, back, chest, abdomen, shoulders, and arms) of the body. What types of physical activity are appropriate for arthritis? Low-impact aerobic activities including brisk walking, cycling, swimming, water aerobics, gardening, group exercise classes, and dancing. Muscle-strengthening exercises including calisthenics, weight training, and working with resistance bands. These can be done at home, in an exercise class, or at a fitness center. Balance exercises including walking backwards, standing on one foot, and tai chi. If you are at risk of falling, balance exercises are included in many group exercise programs. Moderate, low-impact physical activity is safe for people with arthritis. Activity should be in addition to doing usual daily activities. Activity can be broken up into small amounts, at least 10 minutes at a time, during the day. More health benefits are gained with more activity. The benefits of physical activity far outweigh the risks. People with arthritis may take more time for their body to adjust to a new level of activity. Inactive people should start with a small amount of activity, for example, 3–5 minutes 2 times a day. Adding activity in small amounts and allowing enough time for your body to adjust to the new level before adding more activity is usually safe. 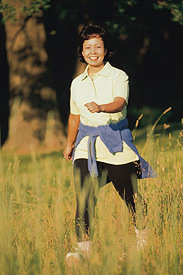 Modify activity when arthritis symptoms increase, try to stay active. Arthritis symptoms come and go. Most people completely stop activity when their symptoms increase. It is better to first modify your activity by decreasing the frequency, duration, or intensity, or changing the type of activity to stay as active as possible without making your symptoms worse. Activities should be "joint friendly." Unsure of what types of activity are best for people with arthritis? 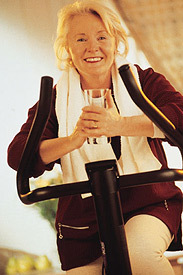 A general rule is to choose activities that are easy on the joints like walking, bicycling, water aerobics, or dancing. These activities have a low risk of injury and do not twist or “pound” the joints too much. Recognize safe places and ways to be active. Safety is important for starting and maintaining an activity plan. For inactive adults with arthritis or those who do not have confidence in planning their own physical activity, an exercise class designed just for people with arthritis may be a good option. For those who plan and direct their own activity, finding safe places to be active is important. For example, while walking in your neighborhood or at a local park, make sure the sidewalks or pathways are level and free of obstructions, are well-lighted, and are separated from heavy traffic. Talk to a health professional or certified exercise specialist. People with arthritis should be under the care of a health care professional. Many health professionals are a good source of information on what types and amounts of activity are appropriate for people with chronic conditions and disabilities. What should I do if I have pain when I exercise? Modify your exercise program by reducing the frequency (days per week) or duration (amount of time each session) until pain improves. Changing the type of exercise to reduce impact on the joints – for example switch from walking to water aerobics. Do proper warm-up and cool-down before and after exercise. Exercise at a comfortable pace – you should be able to carry on a conversation while exercising. Make sure you have good fitting, comfortable shoes. Pain is sharp, stabbing, and constant. Pain that causes you to limp. Pain that lasts more than 2 hours after exercise or gets worse at night. Pain is not relieved by rest, medication, or hot/cold packs. Large increases in swelling or your joints feel “hot” or are red.